The general aim was to produce a management oriented decision support system on interdisciplinary basis to promote a sustainable development of rural areas situated in the tropical rain forests affected by intensive and growing human pressure. The decision support system was based on knowledge related both to local and to global levels to improve the socio-economic conditions by the use and protection of natural resources. The investigations were carried out under the coordination of Universidade Atlântica (Portugal) in Brazil (Bahia, catchment area of Rio Cachoeira) and in Costa Rica (Area de Conservacion Cordillera Volcanica Central. GIS-based regionalization of climatological and hydrological parameters (see example map of groundwater recharge). Vulnerability assessment of the ecosystem water taking into account land use, vegetation and infiltration. 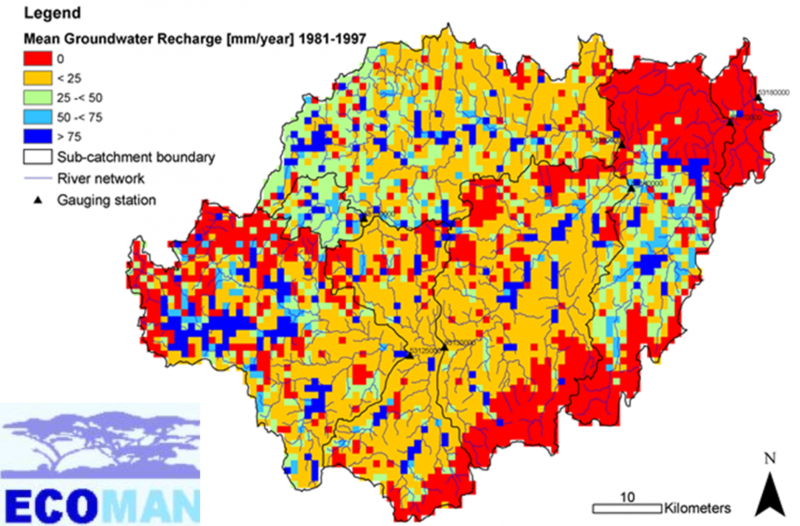 Assessment of the impact of land use on the water quality and water quantity. Analysis of trends related to land use changes. Analysis of runoff generation and groundwater recharge, interactions with vegetation and land use: Check, calibration and application of models of infiltration and runoff generation. Building of scenarios: Simulation of the impact of existing and future changes of land use (deforestation) and economic activities to runoff generation, groundwater recharge and groundwater flow. Decision support system (DSS) and integrated management concept of land use – surface water and groundwater interactions.